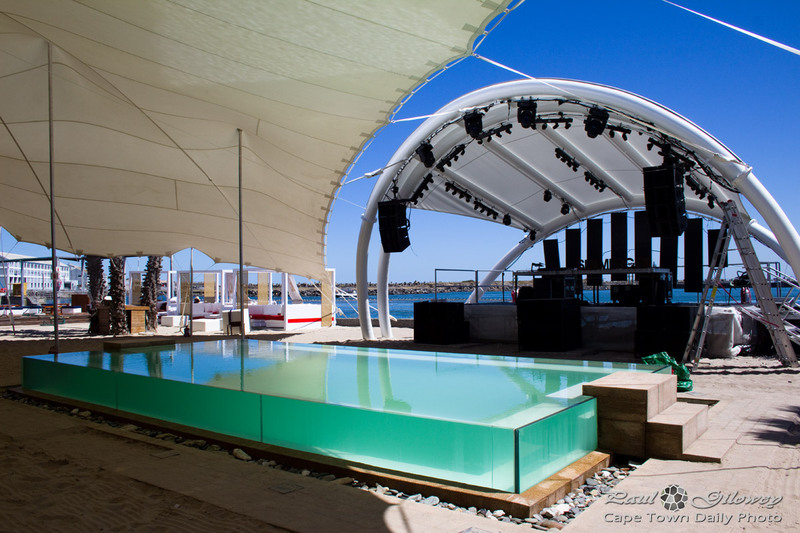 Shimmy Beach Club (in the harbour precinct) has this chill pool surrounded with beach-like sand, where guests can take a shaded break from the hot day. Behind the pool is a stage (check out their calendar to see what's happening), and in front of the stage is bar area, with the formal restaurant to the left. I only visited once, at 11am when they open, so it wasn't very busy, and as can be expected, there really wasn't much happening. But, I can imagine that it gets quite packed with 20/30 somethings as the day and evening wears on. Shimmy Beach Club is an interesting concept - quite different to any other venue we have in Cape Town, and for that reason you should probably pay them a visit. I'll certainly visit in the evening sometime - I'm keen to see if they manage to pull it off with style, or if it ends up being pretentious with no real class. Posted in General and tagged restaurants on Monday, 8 December, 2014 by Paul.